The following is a guest post by Jennifer Hersom, Sr. Product Marketing Manager at Salesforce. 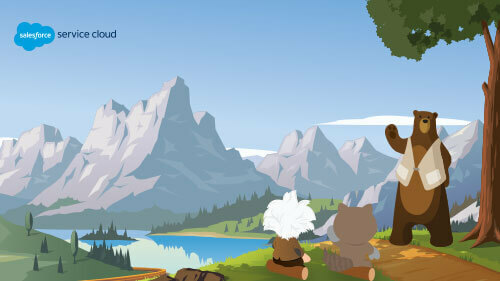 To learn more about Salesforce, visit their website. We sell Service Cloud to our customers, but we also use it ourselves. When people learn that Salesforce is a Service Cloud customer too, they often ask about the way we run our own contact center. And we are happy to share. One of the ways we answer these questions is by inviting customers to visit our Customer Success Center — that’s what we call our contact center — in Portland, Oregon where they are treated to a master class by senior agents and managers. This behind-the-scenes look at the way Salesforce does customer service has been so popular, we’re now making the sessions available online so anyone can access them. Customer service has entered a new era: the “Age of the Customer.” Today’s customer is much more empowered than ever before. They don’t have to argue their point on the telephone in one-to-one conversations. If they’re not happy, they can post about it on social media or leave damaging negative reviews. In the Age of the Customer, people look for solutions on their own terms, using their preferred channel to find answers and connect with businesses. While all these changes have been going on, a shift has also occurred in the expectations of people within business organizations. The call center is moving from a “cost center” to a “profit center,” where agents now need to upsell products and services, or flag opportunities for the sales team. Businesses rush to keep up with these new expectations, often inadvertently creating an agent and manager knowledge gap, where new products and the soft skills needed to run them have to be learned. This trend affects customer service professionals at Salesforce and across the industry. Any user of Salesforce is our customer, so in the same way that they must respond to their customers, we must respond to ours. We have to react to changes in expectations and create a customer service experience with Service Cloud that meets customers where they are, on any channel. The new, online Service Cloud Master Class will show customer service professionals how to adapt their service to the needs of today’s customers. In a series of seven on-demand videos — cut down to easily digestible 20-40 minute sessions — we lift the curtain to give an inside look at the way Salesforce handles our own customer support. Participants in the course will hear from Salesforce’s Tier 2 and Tier 3 Success Agents; Tier 2 Success Agents provide in-depth technical support and Tier 3 Agents offer technical expertise. Viewers of the new videos will also hear from Customer Success Managers on some of our Salesforce-tested best practices for working in an omnichannel contact center. The evolution of customer service presents challenges for even the savviest and seasoned professionals. The need for more expert advice has never been more critical and we’re here to help.